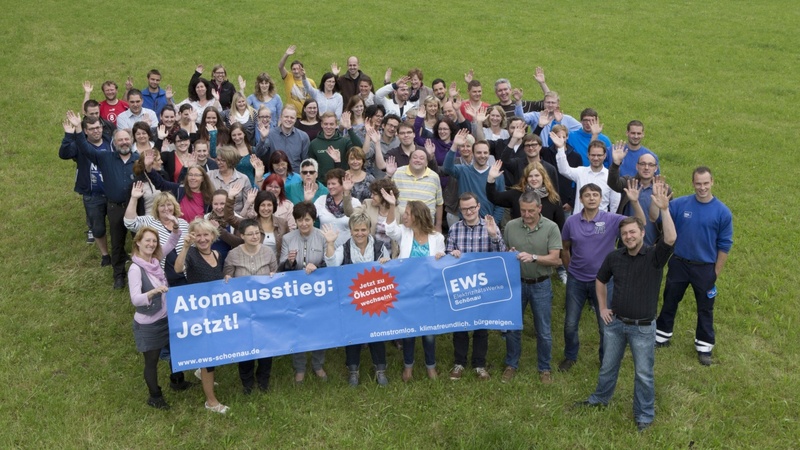 We proudly thank the Elektrizitätswerke Schönau (EWS) for being a sponsor of the International Uranium Film Festival. The EWS supplies people throughout Germany with green power and eco-gas and works in various ways towards bringing about the energy revolution. The revolutionary EWS-Project started in the aftermath of the Chernobyl nuclear accident. A handful of committed citizens decided to become active together in their community in the town of Schönau in the German Black Forest region and created a nuclear- and coal-free energy supply belonging to citizens. Since the local grid operator had constantly obstructed related citizens’ activities, which involved initiatives to save energy and to promote environmentally friendly power generation, local activists came up with the idea of acquiring the Schönau power grid to determine the conditions for its operation themselves. This anti-nuclear initiative stood firm and upheld its demand in two local referenda. Nor could the excessive, multi-million purchase price quoted by the incumbent prevent the activists from continuing their campaign. As a result, this civil-society initiative was the first of its kind in Germany, in 1997, to take over the grid as well as electricity supply to the local community. The press endearingly referred to them as the “Schönau electricity rebels” who “had won a David versus Goliath battle”, and the victory of the Schönau people over nuclear lobbyists was met with much enthusiasm throughout the country. When the German electricity market was deregulated in 1998, EWS was quick to seize the opportunity to supply all its Schönau customers exclusively with electricity generated from renewable and cogeneration sources. As a result, Schönau completely freed itself of power supplied from nuclear and coal-fired plants. EWS also launched comprehensive programmes to subsidise the installation of renewable energy and cogeneration systems. This is why the proportion of electricity from green sources supplied to Schönau has increased ever since. Marcia Gomes de Oliveira, Brazilian social scientist, filmmaker and the Executive Director of the Uranium Film Festival, says, “We are so proud that the EWS Stromrebellen are supporting us this year." The next International Uranium Film Festival in Berlin 2017 will happen October 11th to 15th in the Cinema at the KulturBrauerei Prenzlauer Berg, Schönhauser Allee 36 and in the Zeiss-Großplanetarium, Prenzlauer Allee 80. The International Uranium Film Festival (IUFF) is reaching its seventh year. During the past years the Festival has screened hundreds of well done atomic & nuclear films in Rio de Janeiro, Berlin, New York, New Delhi, Mumbai, Munich, Santa Fe, Montreal, Los Angeles and several other cities around the world. The International Uranium Film Festival continues in 2017 and beyond. But it needs your support. The Uranium Film Festival depends on independent donations and people from all over the world who believe in the festival and its mission. We welcome any donation! Or send your donation by bank transfer. Thank You!